Working groups and special sessions are your chance to dive into focused topics, discuss issues and concerns with a group of colleagues facing similar challenges, or develop action plans on particular topics. Please note that some of these sessions are offered Thursday afternoon from 1:30 – 4:30 pm, which is the same time as the field trips, and other sessions are offered at the same time as the concurrent oral sessions. No pre-registration is needed to participate in working groups and special sessions. Wetland scientists from a variety of backgrounds will address challenges and opportunities facing students, young professionals, and people considering a change in the direction of their career in fields related to wetland science. We’ll discuss “lessons learned” and the role of networks to support discovery and learning. Moderator Susan Schumacher (We Energies) will allow ample time for questions and discussion of solutions and strategies to help support advancement in satisfying wetland science careers. This session will provide tribal wetlands staff with the opportunity to more formally interact, share ideas and best practices, and identify opportunities for collaboration and growth. 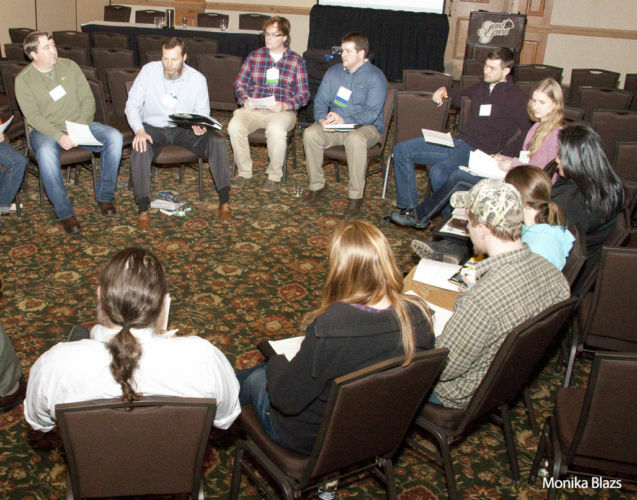 This working group contributes to efforts to foster long-term collaboration, dialogue, and exchange of information that supports and encourages strategic, effective efforts to restore and care for wetlands in Wisconsin. By invitation only — tribal wetland programs staff are encouraged to attend. Join WWA policy staff for a briefing on our budget and policy agenda for the current legislative session, an overview of the new Legislature and Governor, the newly created Wetland Study Council, and other wetland-related bills to watch. We’ll also discuss how you can stay informed and engaged in WWA’s efforts to help Wisconsin adopt more pro-active and comprehensive strategies to protect, restore, and manage wetlands and watersheds. This session offers an opportunity for wetland practitioners—including consultants, federal, state, and local regulators, land managers, and others—to discuss current issues relevant to their daily work. The agenda will be set with the input of those who participated in similar sessions at previous WWA conferences. Please email programs@wisconsinwetlands.org if you would like to suggest other topics for the agenda or would like to be involved in session planning. The Tallgrass Prairie and Oak Savanna Fire Science Consortium and the Lake States Fire Science Consortium are funded by the federal Joint Fire Science Program. The guiding principles for JFSP’s regional networks include facilitating dialogue between researchers, resource managers, and policymakers. Wetlands and Water Quality in Wisconsin: Where Have We Been, and Where Do We Go from Here? This working group will gather academics, conservation professionals, ecosystem managers, and others to have a dialogue regarding wetlands and water quality acknowledging what we don’t know, are unsure of, or should further verify in order to document research needs with the goal of stimulating research questions and action regarding wetlands and water quality. Despite advances in knowledge through decades of basic and applied research in the Upper Midwest and beyond, there are still many questions remaining regarding the connection of wetlands to the water quality of “traditional” waters, and further, the water quality within wetlands themselves. In addition, there is growing recognition of the role that wetland soils play in regulating these ecosystem services—but there are still “many stones left unturned”. Ultimately, the goal of this group is to create connections and foster collaborative field and funding opportunities to address these research needs.